I try to go every year to the tulip fields because it's just so darn pretty. There a so many different kinds and colors of these flowers it amazes me. This was a fun layout because I got to use some fun colors and tried out this multi photo holder. I didn't have to do much to it as all the spaces are there for me to fill just add a little trim and BAM!!! I was done. Do you like the look of a shadow, but the font you have chosen on your Cricut cartridge doesn't have a shadow? Just cut out 2 of the same letter or word, the same size in different colors and layer them together. Pull the top one to one side or the other just a little so it looks like a shadow. Easy fix for a big problem. Hope you enjoy my tip. Every year we go to a little cabin in the fall to close it up for the winter. This is our little escape. This layout was pretty simple but it works for the photos as i love all of the colors. I really wanted most of the focus to be about the photos and colors in them. I used my Cricut to cut out the letters with Songbird and the background patter paper was cut using Close to My Heart exclusive Art Philosophy cart as well. Thanks for checking out my post today. Better late than never. I made this card a couple of weeks ago and then forgot to post it. All products used are Close to My Heart. They make some awesome clear stamps and their paper they have changed a little for the better. It's thicker now and some of the new patterns they came up with rock. Thank you Close to My Heart for making a quality product. I love how my animals don't care that they are a dog or a cat and they are suppose to be against each other. They are best friends. They love each other. I love this layout because i love the pics. But i really like how the friends turned out. I cut out the letters using my cricut, then i ran the letter through my embosser crinkler. I don't really know what it's called but it is very cool. After I crinkled the letters i used paint on the lines to define them a little better. hope you enjoy. I don't know where the time flies by to but another year has passes us by. Marissa's Birthday was great this summer. We had a BBQ in the sunshine and the whole family came by to wish her a very happy birthday. Love this paper pack we found at Michaels. It's the Recolections brand and was on sale. Love it. I used my cricut for the letters and the cute banner. A road trip is a great way to pass a day. And oh so much fun when you are going to see new scrapbooking products. Shannon and I got up and left her house by 3:30am. Oh Dark 30. Wow it was early but so worth it. I had to scrap our road trip of fun. Through traffic and tunnels, over bridges and expressways. We made it there and home in one piece without too many detours and only got lost a little. Hope you enjoy our fun day. 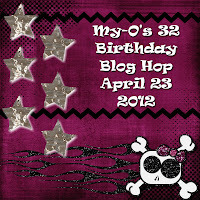 I have been an avid scrapbooker and card maker for over 8 years and love it all. Anything colorful is what I like.